This alloy steel shear pin or shear bolt fits most Polar 76, Polar 78, and Polar 78ED paper cutters. The main shank is 1.84" long below the head. It has an M12 thread. 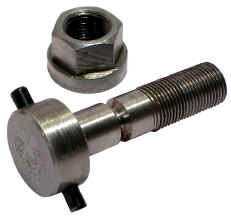 Included with each shear pin is a mating washer faced hex nut (collar nut) and a steel roll pin. The roll pin is supplied already installed in the cross hole. The head measures 22mm (.86") in diameter by 9.5mm (3/8") thick.